UPDATE! 7/15/18 I”m still using Hammermill paper, but I’ve switched to Hammermill Copy Plus – available to Walmart and Target! Remember it MUST be a full fiber paper, not a recycled paper (they have plastic sheets between the recycled fibers). I prefer the original way – black and white (b/w) transfers using a TONER BASED print or copy. TONER BASED means that it’s either printed on a b/w laser printer or on a toner based copier, set on b/w. I get my prints from my local Kinkos. Make a couple of test prints before you print 50 copies of an item! I size most of my transfers to 3×3 inches or bracelet lengths. The paper should not be larger than the sheet of clay if you can help it, so size the transfers to what you will most likely need. I chose 3×3 because those bowls above are 2-1/2 inch in diameter and I’ve just stuck with it. 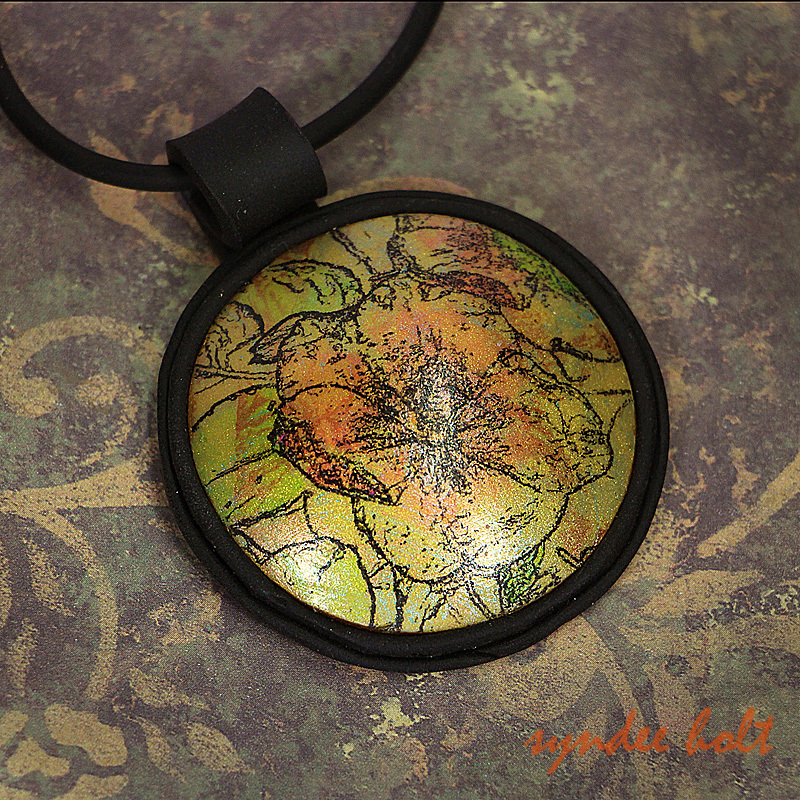 It’s a good pendant size – it gives you room to work with design. I’ve provided PDF downloads of my transfers on a separate page. These are my original artworks for the most part. So where do you find images to transfer? 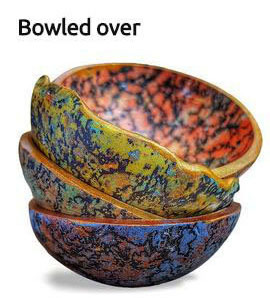 The texture on the bowls is a Photoshop layer texture that I worked with. Google image can work, just make sure that it is not a copyrighted image. It’s much more fun BY FAR to create your own transfers – whether you can draw your own or create your own. 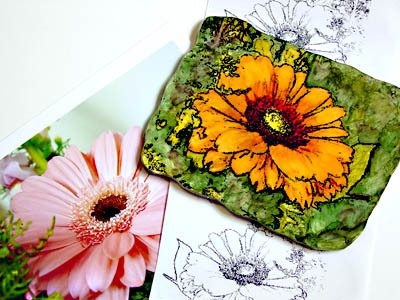 If you don’t want to draw your own, you can find lots of graphic transfers online. I like RF Clipart – they only charge a couple of dollars and their permissions for use is broad. Flowers, leaves, patterns work the best. I used to create a line drawing of the image in Photoshop, but nowadays anyone with a cell phone that has a camera has an editing program and the photo editor almost always has a decent sketch filter. There are also lots of free apps for creating a sketch from your drawing. Once you have your line drawing, you can either create your page in Photoshop or Word or other program. Print the page out just to check the sizes before taking it to Kinkos. Portraits and words can also be transferred, but you need to be able to flip the image from left to right or it will come out backwards! If you want to try a portrait, make sure that there is plenty of light in the eyes or you will end up with a skull line drawing. Remember that you have the ability to “sculpt” or add textures after the transfer is complete and before baking! My son’s cheeks, chin and the heel of his hand are prominent in the transfer above, because I added cotton balls behind the sheet of clay and gently pressed the clay down around the balls before baking. SO HOW DO I TRANSFER? 72% rubbing alcohol was my go-to transfer medium for many years (not 90%, not Wintergreen – just the plain regular kind!) I put the transfer face down on the sheet of clay and quickly applied the alcohol with a cotton ball, taking care to soak the ENTIRE transfer quickly. Let it just about evaporate and wet the paper again. Once that application is just about evaporated, dampen the paper again and gently peel an edge to see how the transfer is going. SLOWLY peel the paper up, this way you can resettle it and rub an area that hasn’t transferred completely with your finger. Using a large spoon or bone tool to ensure that there are no air bubbles is recommended with each application of the alcohol. Just dampen the paper enough so that you can see the image on the other side, DO NOT overwet the paper – a layer of alcohol will sit between the paper and the clay if you do and the transfer won’t happen. My newest go-to method is using CLEAR hand sanitizer (ethyl alcohol) instead of rubbing alcohol. I use my finger to apply it quickly to the ENTIRE paper, then I gently rub it with a bone tool (or spoon). Then just like above – let it almost dry, reapply, let it almost dry, reapply and start checking out the transfer. Sanitizers have different percentages of alcohol in them. I think the lower percentage works better than higher, just make sure that it is CLEAR! 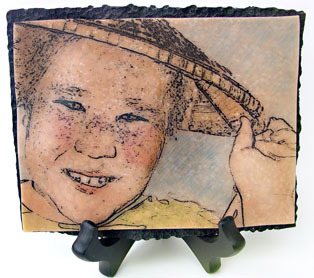 Souffle is my preferred clay for transfer – the ink is immediately dry on it. Premo can have damp ink be careful! Let the transfer sit for about 10-30 minutes before trimming and finishing to allow the ink to dry. Once the transfer is baked, it’s permanent. Use a Micron or other fine tip alcohol based pen to complete any areas that didn’t transfer to your satisfaction. I also use alcohol markers (Chameleon markers) to color my transfers after baking. 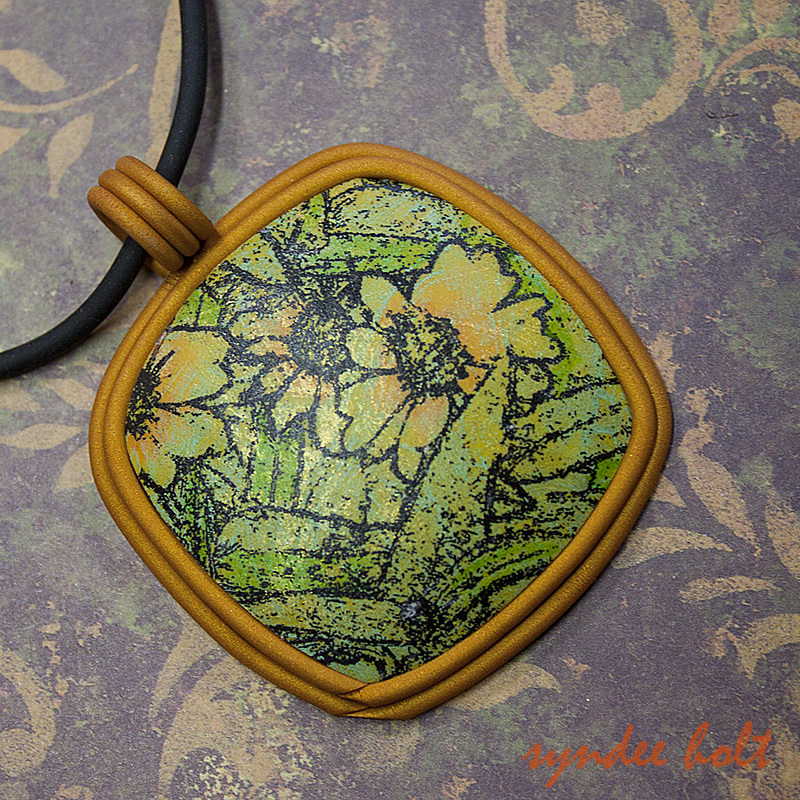 If you are transferring to BOTH sides of the clay sheet like my bowls, work on waxed paper. If you put a transfer face down on paper before baking, it will transfer back to the paper! I make it a habit to always put my sheeting clay for transfers on waxed paper now. Transfers are like cats- they don’t like it if they don’t have your COMPLETE ATTENTION but sometimes they don’t want to be touched..